The first time I came to this restaurant, it was called Houston’s. 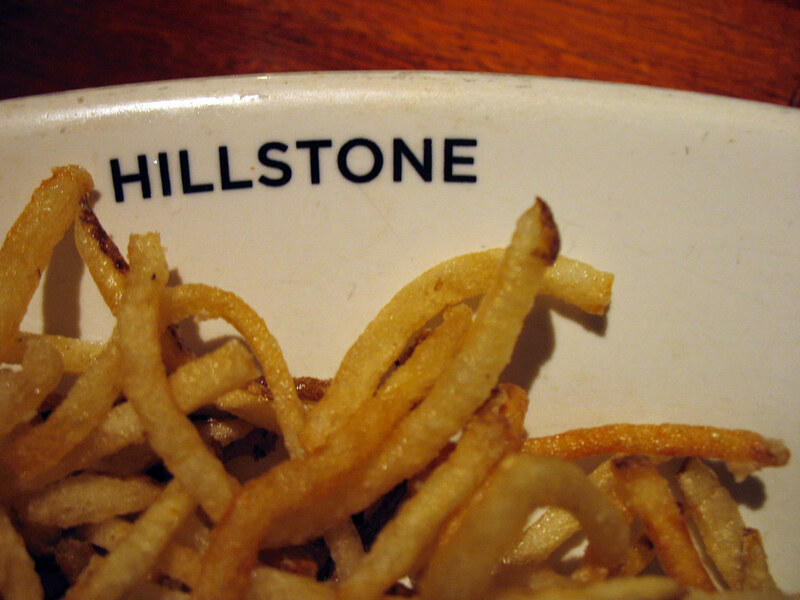 So I have trouble referring to it by its new re-branded name, Hillstone… to me it will always be Houston’s. But whichever moniker you prefer, it still has the best veggie burger I have ever tasted. 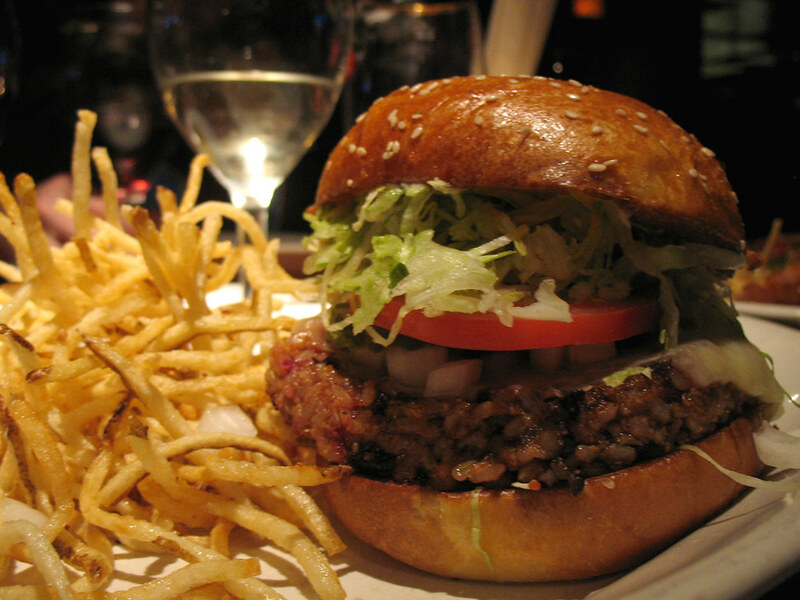 I also have to confess, I have always felt a bit guilty when I admit to someone that my favorite veggie burger is served at a steakhouse. Shouldn’t it ideally be from a locally-owned, organic vegan coffeehouse or some other veggie cliché? The only reason I even discovered this amazing burger in the first place is because I reluctantly allowed myself to be coerced into joining some friends for a birthday lunch. I didn’t want to eat at a steakhouse. And I was even less keen on paying $15 (update: the price is now $20, as of March 2014) for a veggie burger which I expected to be rather poorly-made since it was, afterall, coming from the kitchen of a steakhouse. Of course you can imagine my shock, then, when I took my first bite. Now Houston’s veggie burger is like the holy grail for me. No other burger has measured up to it yet. So when I started this blog, I was thrilled to have an excuse to spoil myself with a delicious dinner. 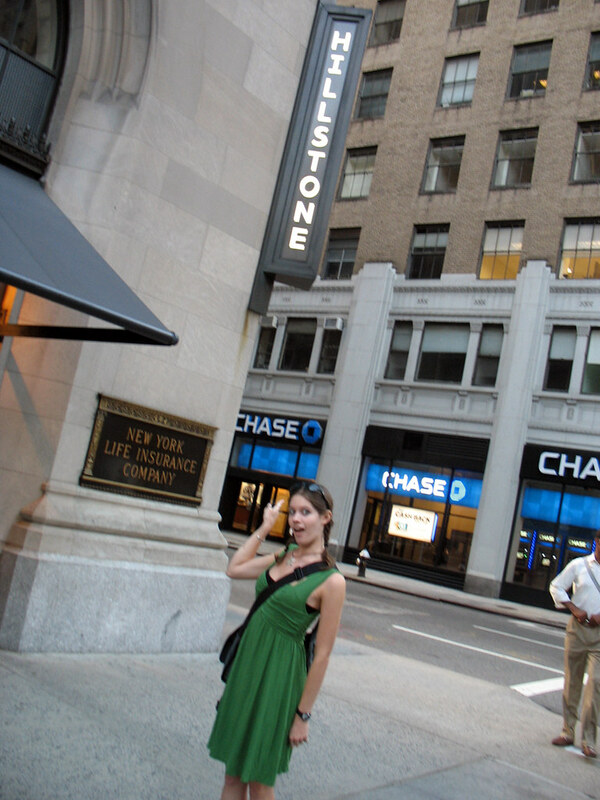 I lured some friends along too, with the promise of mouth-watering food, and made a whole pilgrimage out of it. The menu describes it as a “house-made veggie burger”, and I have fantasized for years about sneaking into their kitchen to see exactly how it is made because it is just genius. Topped with Monterey Jack cheese, onions, pickles, lettuce, tomato, and mayonnaise/mustard sauce… and yes, it comes with fries. Really thin, crispy, delicious fries. It took so much willpower to restrain myself from biting into it until after I had taken these photographs. The burger patty stands out among all others I have tried. I remember the first time I ate it I was so surprised by the pink coloring – which comes from the tiny pieces of beets bleeding their bright color into the rice and beans and other ingredients that make up the patty. There is no green in this veggie burger – no bits of spinach or soy beans or peas. It’s not that I don’t enjoy those, but I certainly don’t miss them in this one because it is perfect just exactly how it is. 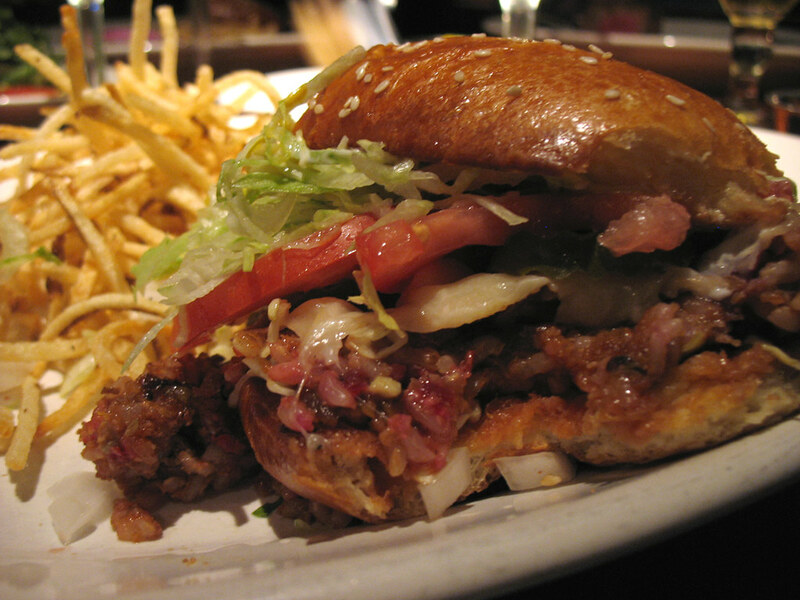 It is simply delicious –and falls apart in your mouth (and your hands a bit too) like a proper burger. I asked the restaurant if the patty itself is vegan, and they told me that it is - as long as you specify that you want to order it without the cheese and mayo. And the bun… I have to compare it to a croissant, as odd as that sounds. It is light and soft and sweet, which is surprising, but works perfectly paired with the patty which is also rather sweet. I normally prefer the really hearty, thick, whole-grain buns. But this decadent pastry-like one has a special place in my heart nonetheless. GM (a former vegetarian) actually said it deserved to be in the top three on his veggie burger list, stealing the spot from a burger joint in his hometown of Toronto. Scott (always an omnivore) said there was too much rice, but it still tasted good. I think the real test of it was whether it lived up to my expectations and the memory I had of it as the most amazing burger ever… had my mind exaggerated its quality in the year that had passed since I last tasted it? Not at all. And I cannot wait until the next time I can enjoy it. Tip: Make a reservation if you are coming around dinnertime and don’t want to have to wait for a table. I have only been here for lunch on the weekends, so I cannot say what a weekday lunch is like, but on Saturday or Sunday you do not need a reservation. I've been hearing alot about this burger, so your post and pictures are welcome (and appetizing)! I'll have to find out if the burger- sans cheese & mayo- is vegan. I contacted the restaurant and they said the burger patty IS vegan (as long as you order it without cheese and mayo). I updated my post so other people will have this information too. My filet mignon was top-notch, too, if done more than the rare I requested. I love Houston's, did not even know they had changed the name, it's a wonderful restaurant that's for sure and I have had their veggie burgers in the past (when I was still a vegetarian) YUMMMMMMMMY!!!! We shall have to go there one night Ali, my treat! Oh my goodness, that looks delicious! I must have this the next time I'm in town. Thanks! Since I live in NC I don't think I will ever try this place so wondered if it is possible to get the recipe. You can get this vegeburger at all the Hillstones around the country, Janet...we've been to one in Pompano, Florida and another one in Fort Lauderdale. And it's saved our hungry vegetarian lives...their aritchokes are fab, too! Their menu says 'sweet soy', you did not mention that. Does it have an 'asian' taste at all? We have one here in Nola, so, I MUST GO ! The bun is not vegan. 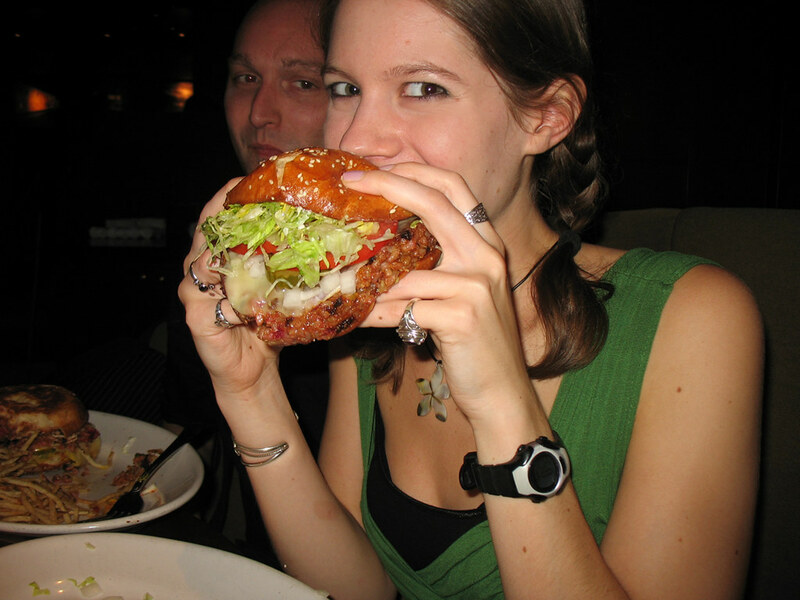 I'm an omnivore and I tried this burger. I think it's ok but the patty is too soft for me (falls apart too easily). My favorite veggie burger so far is the subway veggie patty (aka veggie max) although i dont know if it's vegan. I find the veggie patty's texture to be more similar to meat.